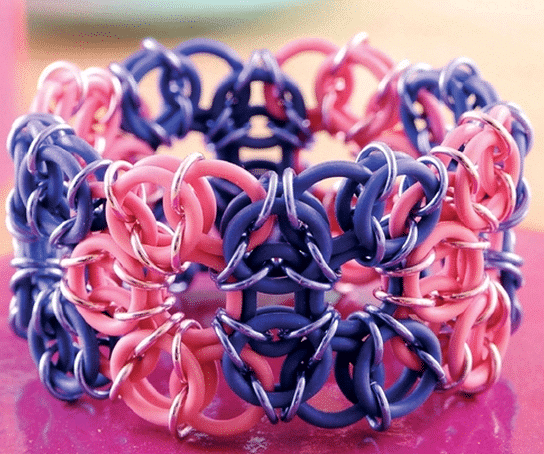 Make this awesome stretchy O-ring bracelet! 1 – The red rings in each step show the rings being added. Link four purple O-rings with one purple jump ring (shown in red here). Position the rings so that you have one O-ring as your center ring at the bottom. The remaining three O-rings are arranged so that the middle O-ring is pulled to the right leaving a pair of O-rings (upper and lower) at the start of the fan. 2 – Weave one purple jump ring (shown in red) through one new purple O-ring, the single O-ring pulled forward in the previous step and a second new purple O-ring. Link to the center ring at the bottom and close the jump ring. Position the O-rings as shown. 3 – Place one purple O-ring in between the two purple O-rings just added. Weave one purple jump ring through the gap made between the three O-rings and link to the center ring at the bottom. 4 – Repeat steps 2 to 3 continuing to add O-rings until you have made a fan using twelve O-rings. You should have pairs of O-rings at each end. Make four purple fans. 5 – The pink fans are made in the same way but have single O-rings at each end. Link four pink O-rings with one pink jump ring. Position the rings so that you have one O-ring as your center ring at the bottom. The remaining three O-rings are arranged so that the middle O-ring is pulled to the left leaving a pair of O-rings (upper and lower) to the right. 6 – Place one pink O-ring in between the pair of pink O-rings from the previous step. Weave one pink jump ring through the gap made between the three O-rings and link to the center ring at the bottom. 7 – Continue adding O-rings as before until you have made a fan using eleven O-rings. You should have single O-rings at each end. Make four pink fans. 8 – Position one pink fan underneath one purple fan. Link the two fans by weaving two pink jump rings through the top center gaps made by three pink O-rings and the center purple O-ring. On either side of the center point and using four pink jump rings, weave through each of the remaining gaps made by three pink O-rings. 9 – Use purple jump rings to finish joining the fans. Slip the single pink O-ring between two end purple O-rings. Weave one purple jump ring through the gap created by the three O-rings and link to the center purple O-ring. Link another purple jump ring through the same gap on the outer edge. Repeat on the other side of the fan. 10 – Position one purple fan underneath the pink fan. With two purple jump rings, link the two fans by weaving purple rings through the top center gaps made by three purple O-rings, and the center pink O-ring. Slip the single pink O-ring between two purple O-rings. Weave one purple jump ring through the gap created by the three O-rings and link to the center pink O-ring. Repeat on the other side of the fan. 11 – Use six purple jump rings to finish joining the fans. Link purple jump rings through the same gaps as you last linked a purple jump ring in step 10 (where the pink and purple O-rings overlap). Link purple jump rings through the remaining gaps along the outer edge of the purple fan. 12 – Once you have joined all the fans bring the pink end fan around to meet the first purple fan. 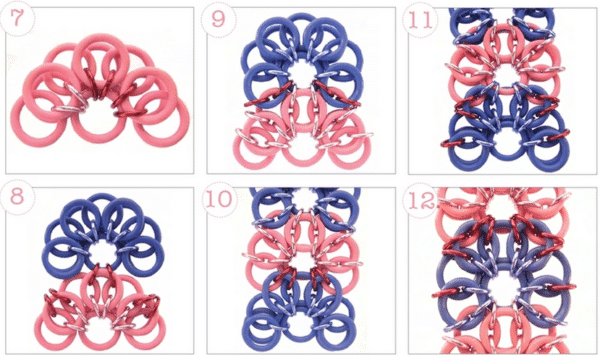 Using purple jump rings, join your cuff by repeating steps 10 to 11. For more project such as this visit Craft Organizer. 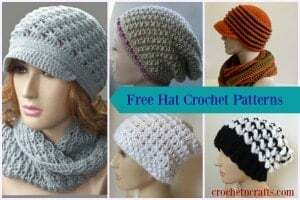 There you will find daily to weekly tips on everything related to crafting, from DIY projects and how to organize your craft space.